As we enter the dog days of summer, even the mild, Mediterranean climate of the Niagara region can start to feel a little warm; therefore, it’s a good idea to sprinkle indoor activities into your vacation itinerary. Additionally, if you are planning an autumn trip to the falls, you might need to plan stops take shelter, as September through November tend to be Niagara’s rainier months. During the winter, low temperatures and sporadic snowfall can chase you indoors. In fact, even in the spring, scheduling indoor-time allows you to rest your feet and learn more about the area. Regardless of when you visit, you shouldn’t miss out on the following amazing indoor activities and attractions around Niagara Falls. It’s hard to imagine being outdoors in the temperate climate of Niagara and then, one step later, being inside a tropical paradise — but that’s exactly what happens when you visit Bird Kingdom. Home to all sorts of tropical animals, especially birds but also reptiles, amphibians, and a few big spiders, this indoor attraction is thrilling and educational. In the world’s largest free-flying aviary, you can feed and hold a bevy of birds, and dozens of exhibits showcase more delicate and less friendly creatures. Animal trainers and caretakers are eager to teach you about the animals, including where and how they live in the wild. Visitors usually reserve at least an hour to explore the museum and exhibitions, but you might allow even more time in your itinerary to take it all in. At the gate, tickets are $17.95 for adults and $13.95 for kids — but you can save a few dollars by reserving your tickets online. There are waterparks — and then there is Fallsview Indoor Waterpark. Home to more than 16 waterslides, a gigantic wave pool, a water-filled rain fortress, a 1000-gallon tipping bucket, a toddler splash area, an activity pool, a sundeck, and an adults-only jacuzzi. Fallsview provides everything you want at a waterpark and then some. The park is enclosed in a three-acre space; because it is indoors, you and your family can relax and enjoy the excitement of the waterpark regardless of the weather outside, and you don’t have to worry about your kids getting lost, sunburnt, or even hungry, because there is a Planet Hollywood bar serving food and drinks all day long. It’s a good idea to expect a full day spent inside the waterpark: Once kids are wet, they rarely want to get dry again. If your trip to Niagara Falls is planned for the peak season, you can pay $49.95 per person for day passes, but you might be able to save by purchasing a waterpark package through your hotel. If you’ve ever been lucky enough to see your favorite celebrity in the flesh, you probably remember the heart-pounding, jaw-dropping exhilaration of meeting someone famous. At the Movieland Wax Museum, you can repeat that experience again and again with all sorts of different stars. Finally! You can snap a picture with Justin Bieber or Katy Perry; you can meet your favorite fictional characters, like Lara Croft, Indiana Jones, Captain Jack Sparrow, or Hannah Montana; you can even see stars that have been long-gone, such as Marylin Monroe, Elvis Presley, and Michael Jackson. The wax museum is a great opportunity to educate your kids about cultural icons — and gush over some of your favorite celebrities from the past and present. You can spend at least an hour touring the wax museum and gift shop — but that’s not including the activity of making your own souvenir wax hand. Admission costs $10.99 for adults and $6.99 for kids, but if you invest in the Clifton Hill Fun Pass, you can save on more exciting indoor activities. 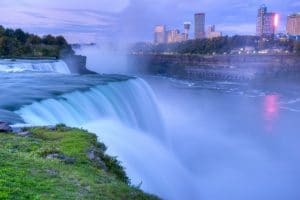 If you are like most Niagara Falls visitors, your goal in coming to this popular destination is seeing the magnificent, natural waterfalls — everything else is just a bonus. 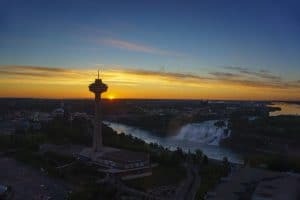 To that end, you simply cannot miss a trip up Skylon Tower, a 775-foot-tall tower that provides unbelievable panoramic views of the falls and beyond. Skylon offers both indoor and outdoor observation decks, making it a must-visit come rain or shine. Plus, you can enjoy the views during lunch or dinner in the revolving dining room. Downstairs, Skylon boasts a 3-D/4-D movie theater that teaches about the geologic history of Niagara Falls as well as a family fun center replete with arcade games and rides. How long you spend in Skylon depends on how many of its amazing activities you plan to engage in. Tickets to the observation decks cost about $15 for adults and $9 for kids, depending on where you purchase them; however, if you eat in the revolving dining room your trip to the top is free. Niagara Falls History Museum. With artifacts dating from the beginning of inhabitance around Niagara Falls and exhibits discussing modern-day issues, this museum covers everything you ever wanted to know about the area. Battle Ground Hotel Museum. Niagara was an important territory during the War of 1812, and some of the fiercest battles were fought just outside this museum — which is housed in a tavern that stood there almost two centuries ago. Willoughby Historical Museum. A rural branch of the Niagara Falls History Museum, this museum’s exhibits showcase life for country folk in the Niagara region.